Stretch Your Horse - Stretch Your Horse Mobile App. DIY horse stretching video tutorials. Show Your Horse Some Love! Save Money on Vet Bills. All horses, regardless of discipline, must have their muscles stretched. Your horse is d​epending on you to do this! Take our FREE Horse Stretching and Movement Assessment. Get 3 Recommended Stretches For Your Horse! Watch this video. Learn why a top lameness vet and trainers agree stretching is critical to prevent injury and get great results from your horse! 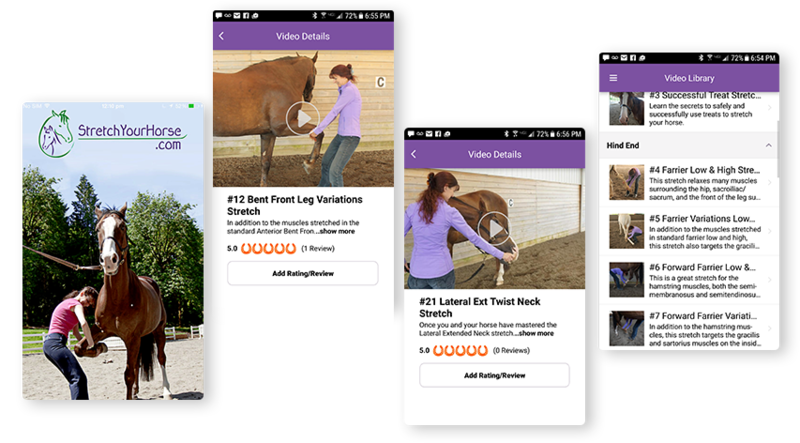 Stretch Your Horse is a video-based mobile app designed to teach riders, vets, farriers, trainers, and horse lovers all over the world how to safely and effectively stretch their horse's muscles anytime and anywhere... even if there is no cell service or internet connection. Learn to stretch your horse for a fraction of the cost of a vet or bodywork bill. The app contains 25 "how-to" stretching videos available as "in app" purchases. Purchase the app for just $2.99. Purchase includes 3 free videos. Buy all 22 videos as one bundle for only $69.99. That's a 20% discount versus individual video purchases! Need Help Getting the SYH App? Just like humans, your horse's muscles need attention to remain healthy. Only you can stretch your horse's muscles. Your horse is depending on you to do this! improve performance and prevent injury. Check out my article in Natural Horse magazine to learn more details about why stretching is critical for your horse's health and longevity! The Stretch Your Horse App videos put scientific, practical, easy to follow information directly into the hands of horse owners all over the world to help them keep their horse healthy, sound and performing to the best of their ability regardless of their riding discipline or experience level. I highly recommend this App to all riders and routinely recommend this App to my clients. Dr. Jack Root, DVM, Owner of Oakhurst Equine Veterinary Services and Grindstone, 1996 Kentucky Derby winner. My horse, Owyn, increased how far he was able to stretch his back legs by well over 4 inches in just 2 weeks doing the hind leg hamstring stretch called Forward Farrier. His canter transitions and circle work improved dramatically. I love this App!! Check out this video of his journey! My horse, Fay, is a 24 year old Percheron. She has always had a choppy gait. Her front end always seemed to be tight. We started doing 3 different stretches: one for her front legs, one for her shoulders and one for her pec muscles in the "armpit" area. Within 2 weeks, there was a dramatic difference. After 3 weeks, all I can say is WOW! Her gait is now very smooth and better than it has ever been! We love the Stretch Your Horse App! I have been a horse trainer for over 19 years and riding horses all of my life. Stretching your horse's muscles is a critical piece of the puzzle in order for you and your horse to be successful in any riding discipline. Sometimes when a horse appears to have a "training issue," it is not really training issue. They simply can't do what you are asking because their muscles are too tight. I stretch my horse's muscles as a regular part of their routine. I learned a lot from the Stretch Your Horse App about how to improve the stretching I was doing and also learned some new stretches. The Stretch Your Horse App is a great app that can teach you how to effectively and safely stretch your horse's muscles too! Are You Choosing the Right Stretches For Your Horse and Doing Them Correctly? Each horse has different areas of muscle tightness that need attention. The Stretch Your Horse Video Library contains detailed stretch descriptions to help you choose the right stretches for your horse. The app also contains color-coded horse muscle images so you can see what muscles are being stretched as well as the Top 10 Horse Stretching Guidelines to help ensure you safely do each stretch and get the maximum benefit. Solutions for the Girthy or Cinchy horse and a massage move tutorial to prevent pain in this area for every horse! Get all the latest horse stretching and general horse health tips!